In early July, Nyango and Naserian Mission held a special ceremony for young men making the transition to elders. 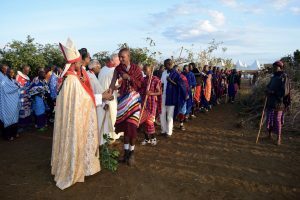 This transitional ceremony has been held in Maasai communities for generation, but this is the first time that Christian blessings and prayers were incorporated into the ceremony. Over 500 men participated in the ceremony; together with their wives and elders of the community, over 1,200 people were in attendance. cess. Next the men proceeded to receive blessings from community elders and greetings from the church clergy. The men processed, in a single-file line, from outside, into the cattle corral. As they crossed the threshold, the community elders anointed the right arm of each young man with a mixture of milk, oil, and honey. The elders washed this mixture from the arm to the walking stick and tree branch held by each young man. The young men then proceeded to shake hands and receive greetings from the clergy. After all the men had processed through, then their wives followed to be blessed by the elders and the clergy. The remaining parts of the ceremony included shaving of heads, symbolizing that the men are leaving their youth behind and are starting fresh as elders. And finally, all of the men participated in a meat-eating ceremony. Each man took a couple pieces of beef and drank a fermented honey drink, each a symbol that they are now elders of their community. 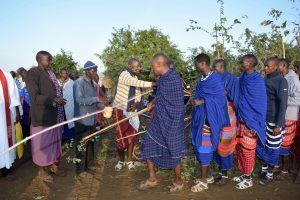 After the completion of the ceremony, the men, women, and elders returned to the open field outside of the cattle corral for singing, dancing, and celebrating. They joyfully celebrated the important transition in their community to welcome new elders. 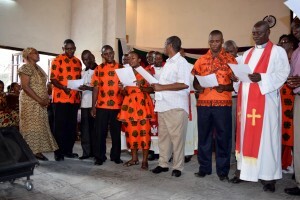 We are grateful for dedicated church leaders in Nyango and Naserian Mission for their commitment to incorporating Christian blessings into this important event, and for their invitation to KELC leaders and Maasai clergy from Kenya and Tanzania. Together we have witnessed a new way forward for our church communities to merge their Christian faith and their cultural heritage. Thanks be to God! Over the course of the 4 days, the young people sang, worshiped, learned, and lived together. 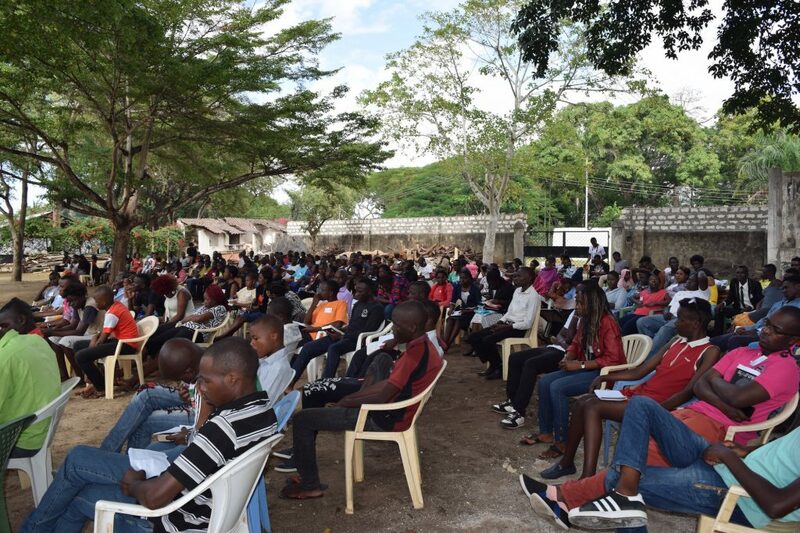 The rally was held at a secondary school in Malindi, which could accommodate all the youth for sleeping, eating, and gathering for the seminar sessions. In keeping with the theme of pursuing peace, many of the seminar sessions focused on creating and maintaining peaceful communities. Radicalization and extremism are affecting many communities in Kenya. The youth reported conflicts between tribes, religions, and political groups within their communities. Together they learned how to recognize and resist radicalization. 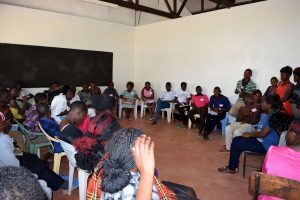 As Kenya enters into a national election next year, it is vital for young people to recognize their role in maintaining peace. After the discussions and presentations, the participants reported they felt more equipped to see signs of radicalization and extremism, and they are prepared to work against these negative forces. On the last evening, the youth relaxed and had fun by holding a talent showcase. There were many performances of singing and dancing, and the night ended with the selection of Mr. and Miss KELC- 2016. We are grateful to God for this wonderful event and for all the dedicated youth of our church. 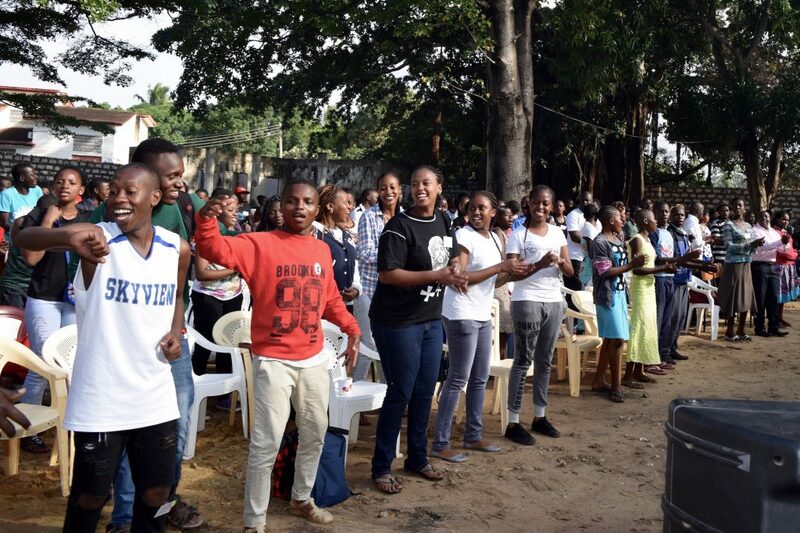 We pray the youth will return to their congregations with refreshed and renewed energy and that they will continue the discussions started at the Youth Rally. 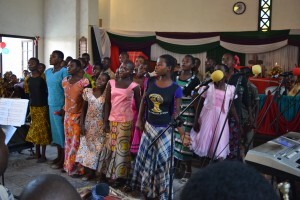 Special worship celebrations are a highlight in the church year for KELC. 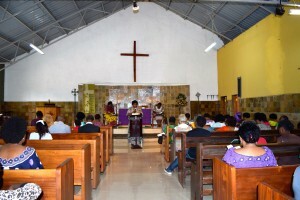 Celebrations for good harvest, special prayers for students before their exams, induction of church elders, and many other events are frequent and important times in the life of the church. Recently we have celebrated two significant events in KELC. District pastors presenting Pastor Agnes for ordination. Bishop Kahuthu ordaining Pastor Agnes. The receiving line to congratulate Pastor Agnes. 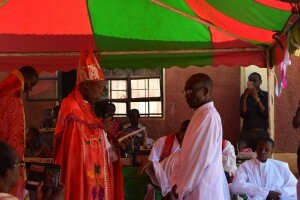 Deacon Simon receiving words of installation from Bishop Kahuthu. 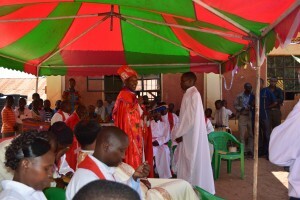 Bishop Kahuthu installing Evangelist Paul Karanja. 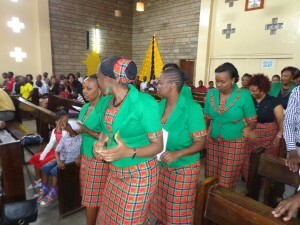 Dancing during the worship service in Kirinyaga. First, in October we celebrated the ordination of a new pastor, as well as the installation of a deacon and an evangelist. 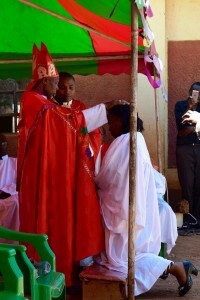 Pastor Agnes Chomba was ordained, becoming the 4th woman ordaining in KELC. 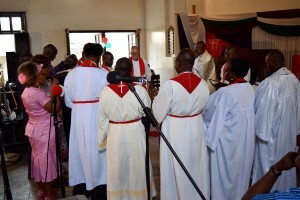 The worship was filled with singing and dancing, in addition to that traditional order of service for the ordination of a new pastor. 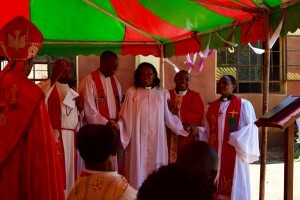 Following her ordination, we celebrated the installation of Deacon Simon Chomba and Evangelist Paul Karanja. 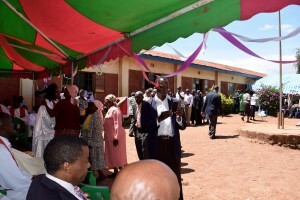 The service was held in the courtyard of a primary school near Kirinyaga, Kenya. More than 400 people attended the celebration, including hundreds of family members of the celebrants. The celebrating and receiving lines were long, with much joy and congratulating. After the worship, the newly installed church workers were showered with gifts, garlands, and greetings from all those in attendance. Everyone shared a delicious meal of traditional Kikuyu food. We wish all the newly installed church workers successful and fulfilling service in God’s church. Second, we celebrated the retirement of one of our pastors. After more than 20 years of service, Reverend Samson Soka will be retiring at the end of 2015. Similarly to the ordination worship, this celebration was filled with singing and dancing. 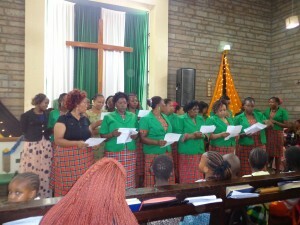 During the worship, 8 choirs offered songs in celebration of Rev. Soka’s retirement celebration. 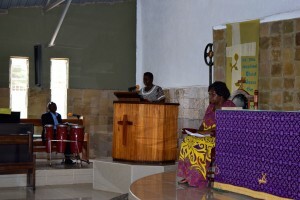 The congregation followed a farewell liturgy and received a sermon from a visiting pastor, Rev. Joyce, from our partner church, Evangelical Lutheran Church in Tanzania. Rev. 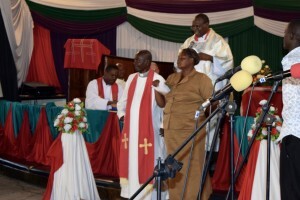 Soka with his wife, receiving a blessing from Assistant Bishop Mang’oka. All church workers offered bible readings to Rev. Soka. 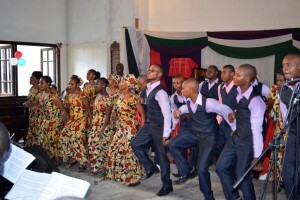 Church members singing during the worship. The worship concluded with gift giving and thanksgiving to Rev. Soka from his colleagues, his church members, and all visitors attending the service. Everyone joined in sharing a meal, before returning to their homes. Congratulations to Rev. Soka and thank you for your service to our church. Special worships are important and valued events in the life of KELC. We rejoice in the opportunity to celebrate together, to lift up the work of new and retiring church workers, and to share in the bounty of friendship, worship, and shared meals that we have received through the love and grace of God. 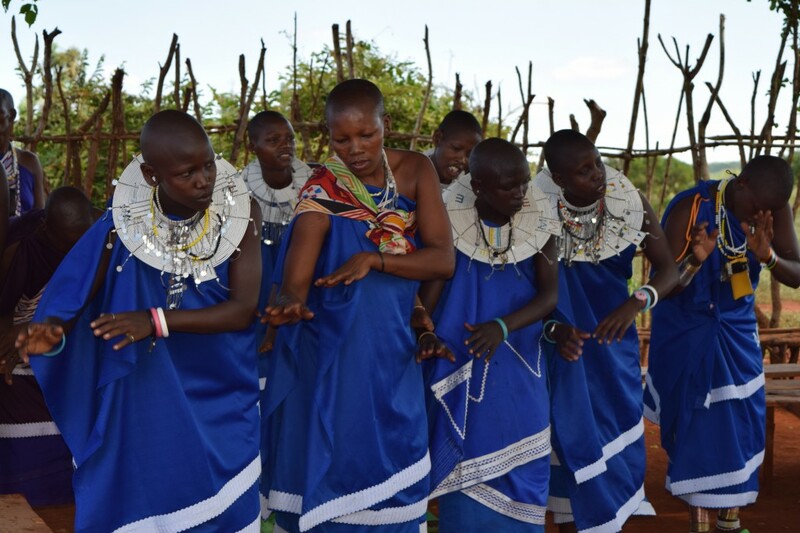 Today, on International Women’s Day, we lift up all the women and girls in KELC. We are grateful that our church is filled with intelligent, faithful, generous, and inspiring women. 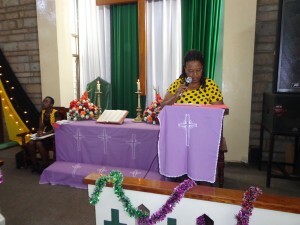 Last Sunday, 1st of March, KELC congregations participated in Women’s World Day of Prayer. 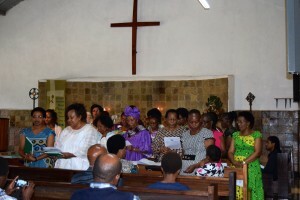 Many of our worship services were led by women and celebrated the many gifts of women in our congregations and around the world. Below are pictures from worship during Women’s World Day of Prayer on 1st March 2015. The Women’s Department is on the move and bringing educational seminars to the congregations of KELC’s South Coast region. 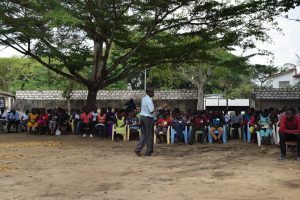 Starting during the last week of November, a group of KELC church workers from the head office, regional women’s department representatives, and KELC pastors traveled to LungaLunga parish, Naserian mission area, and Nyango mission area. 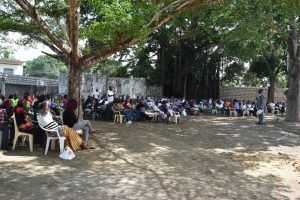 The group traveled to several different congregations to offer educational seminars to the church members, to connect with the members of these rural congregations, and to hear and see the needs of the congregations and members in the region. The KELC Health Department has been busy the last couple of weeks. As a part of their Sustainable Livelihood Support Program, the health department hosted three food distribution events for people living with and affected by HIV and AIDS. 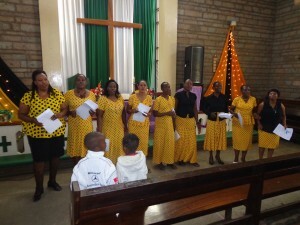 Each of the three KELC parishes in Nairobi held distribution events to support people in the community who have requested assistance through this program. 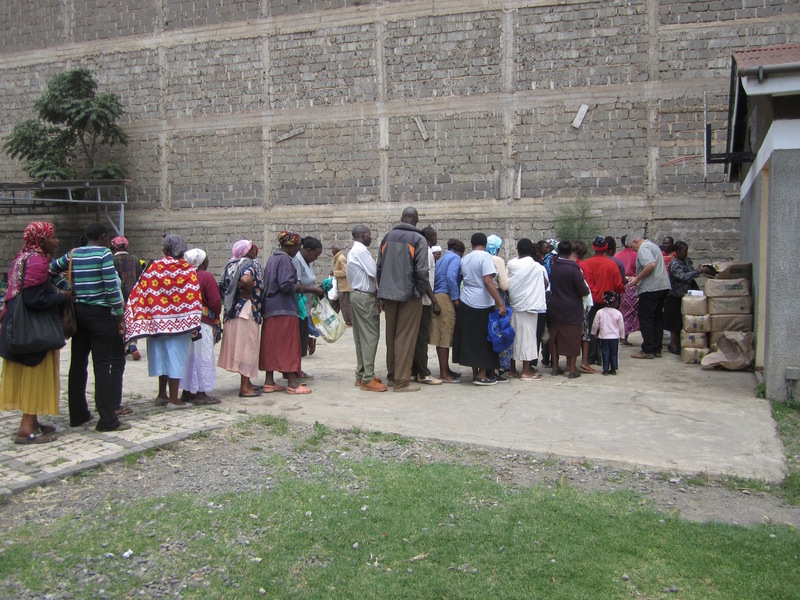 Between Dagoretti, Jerusalem, and Mathare parishes, 600 people received food items. Of the 600 people, 450 are people living with HIV or AIDS; the remaining 150 people are widows or orphaned and vulnerable children. The food distribution included 4,800kg of maize meal, 600 liters of vegetable oil, 1,200kg of nutrition unimix, and 1,080kg of beans.